Deep in the middle of the state of New Hampshire, about an hour and a half north of Manchester, between colonial home villages, "cross country" paths and dense forests, there lies quietly, unassumingly a very special jewel - it is a school called Sant-Bani, a home for about 175 kids beginning with the "K" grade and all the way through to the 12th grade. I was invited to the school four years ago to give a recital, and visited it annually ever since. What attracted me to this school was its independence from the stagnancy of the educational system which surrounds us. Each pupil is an entity, a free spirit which is being cultivated and nourished to search for his own individual path - a "cross country" path. A special emphasis in the school seems to be that education and art are inseparable elements in humans growth. Each of my visits culminates with a solo recital which I give at the school's assembly hall. For me, one of the true climaxes each visit is also the one-on-one interaction with the kids the day before, or the morning of the recital. 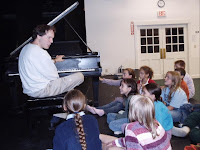 This year I had seven different activities at the school in addition to the recital which was at the Old Opera house in Franklin, NH - in itself a historic landmark worth a special visit when touring the area. At the school I was playing separately for 3rd, 4th and 5th graders, as well as giving a masterclass to selected kids, and talking to the 12th graders etc. Having said all that, it was the one hour session which I had with the entire school that stood above everything else during this trip. 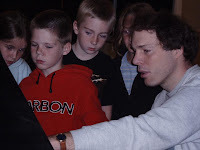 This session opened a secret door, one that was somewhat hidden in the heart of my understanding of music communication and inspiration - A door that when opened, allowed me to experience "reading late Beethoven to young kids". My recital program included the heavenly, though at times tumultuous, yet ending serenely, late Beethoven sonata no. 30 in E major op. 109. When introducing young people to classical music, this piece is not really on the radar for first (or second) choices. Written more than ten years into Beethoven's deafness (1820), this sonata is much more introspective, introverted and reflective than many of the other sonatas he wrote. I feel, as with other late Beethoven works, it requires a certain state of concentration that unless one is elevated to that state, it becomes totally meaningless to listen to such a work. This kind of concentration touches upon one’s internal dialogue within his own self, searching for possible equilibrium, inner balance, possible answers to eternal questions, raising new ones, and so on and so forth. Expecting such concentration from six, seven year olds or for that matter also from the seventeen year olds, seemed to me a musical suicide. What's the point? What will they get out of it? I started the session with playing Myra Hess's arrangement of "Jesu, Joy of Man's Desiring" from Bach's Cantata no. 147 - to "get in the zone". The rest of the time was then spent on Beethoven's late sonata. This was not only the first time that I played the piece for such a young audience, but altogether this was the first time that I played the piece in public. Well, I thought to myself what could be more challenging than to play the piece in front of an audience that will not hold back when a sense of boredom creeps in. I was prepared to do the "unthinkable" - to make cuts in the long last movement if I hear too much movement coming from the little ones. Nonsense! How short sighted was I, how pessimistic... to my credit, though, I would say that none of the teachers (or parents) believed that this would work. I played the Beethoven in its entirety experiencing silence in a way I have only rarely experienced. Alfred Brendel said in an interview that all he expected from his audience is to be "Silent" which when changing the order of the letters becomes "Listen". In this morning session - six year olds, seven year olds, eight year olds and all the way to seventeen year olds, and their teachers, and some parents - they were not only silent, they were not only listening, they were making an internal dialogue. Each individual, in his own way, with his own vocabulary and emotional resources made a conscious and ultimately very successful effort to connect with this divine music, and through it each individual discovered a wealth of new subtleties, new "colors" new "shades", within himself. One day I will probably have more perspective and knowledge to understand these human connections to music, to silence, and to that miracle that is in-between. I hope to know more how to open peoples' heart to classical music, to get them to be passionate and in need for it more and more. I also want be able to understand the concentration that is needed and that state of mind that makes for a dialogue with such pieces as the Beethoven sonata to be creative and reciprocal. But for now, the ability to present this masterpiece and get such enthusiastic responses was overwhelming and truly meaningful. I will never forget that. The following week, I went to play another solo recital, this time at the "Bell concert series" in Jackson Mississippi. I came two days earlier, and went to four different schools playing for about 2000 high-school kids (and some younger ones). The center of my 50 minute sessions was, of course, the Beethoven sonata no. 30 in E major op. 109 which I played each time in its entirety. Alon, I put everything aside and just read your blog, I simply can't help it. What a pity that the interview, due to obvious newspaper limitations, will be just a pale replica of what one can find here.